22The Santos Beach extend for 7 km, which in reality form a single beach, with a unique cove, different from the other cities of the Baixada Santista, the waterway of Santos (called of Canal 1 to Canal 7) that delimit some neighborhoods of Santos, also divid the beach in 7 different beaches, which are named with neighborhoods names of the city. 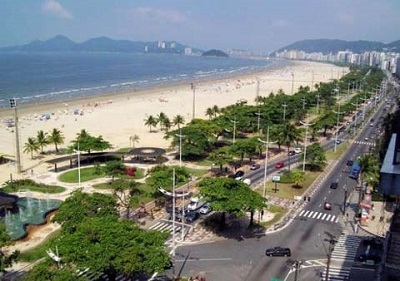 The beaches of the city of Santos have the largest waterfront garden in the world, and one of the most beautiful. Another great positive point of the city is that on all beaches there are several showers. 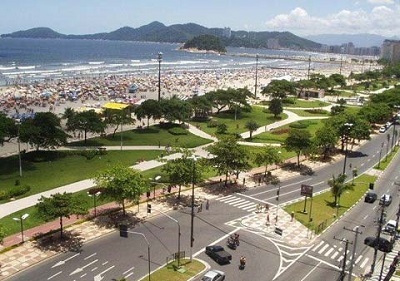 Although the beaches of Santos are usually a litle more polluted than those of the northern coast (of São Paulo Brazil), due to the greater urbanization of the city, there are already more people living in Santos than in other cities, the color of the sea water of Santos is not a result of pollution, but a natural condition of the sea of ​​Santos. Santos, in spite of generating more pollution, also has a great treatment of sewage, and Sabesp’s program called “clean wave”, has been improving this more and more. 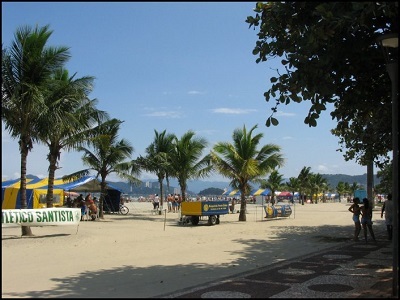 Nowadays it is very rare to see the beaches of Santos as improper. Now we will see some photos and analysis / reviews of the beaches. Although the beaches of Santos derive from a single beach, as we have already said, José Menino beach in Santos has a better tendency for waves, because of this, it is the favorite beach of surfers. Its extension crosses from the landmark of São Vicente until the Canal 1 where is the Submarine Emissary of Santos. The monument of Tomie Ohtake in the Submarine Emissary, also became well known in the city. In the submarine emissary of Santos has a skating rink, many people also ride bicycles or skates in the place. The breakwater offers a beautiful view of the sunset. Do you want see more pics of José Menino Beach? click here. Many call it José Menino beach, considering that it is going from the border to Canal 2, but actually between Canal 1 and Canal 2, it is the Pompeia beach. The Pompeia beach is also good for surfing, including a monument in honor of surfing. The city also maintains a surf school, which teaches surfing for children. 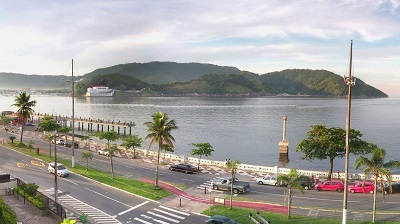 It goes from Canal 2 to Canal 3, right in its center is Ana Costa Avenue, probably the most important avenue in the city. Due to the high concentration of hotels, this beach is the one that most contains tourists. The Gonzaga is a noble area of Santos, leaving from the beach you will find several restaurants, malls, several shops for shopping. Even outside summer, it is extremely difficult to find a parking space, and the parking lots near the beach are very expensive. It goes from Canal 3 to Canal 4, perhaps the second beach of Santos more frequented by tourists, on Saturdays has a handicraft fair with some snack bars, along the coast there is Gibiteca of Santos with free events and commics that are free to read. It goes from Canal 4 to Canal 5, it is in front of the church of the Embaré, important landmark of the city of Santos. 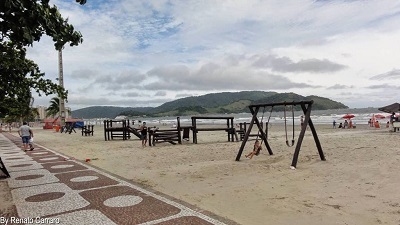 The beach also has a playground which is always kept well maintained. It goes from Canal 5 to Canal 6, next to it is the largest Shopping Mall in Santos. In addition to the mall, has the “fonte do Sapo” is cool for families, especially for the children, that can use skate, skates and bicycle ride. It goes from Canal 6 to Canal 7. It has almost no more sand, so for those who enjoy sunbathing, it is not the best option. 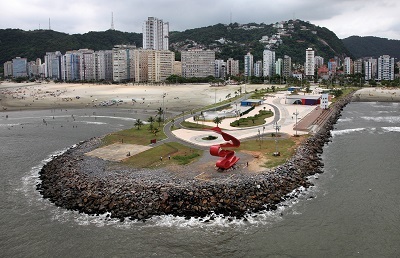 The beach contains much of the famous walls of Santos, it is a great region to relax and observe the sea, the ships, some people like to fish there. 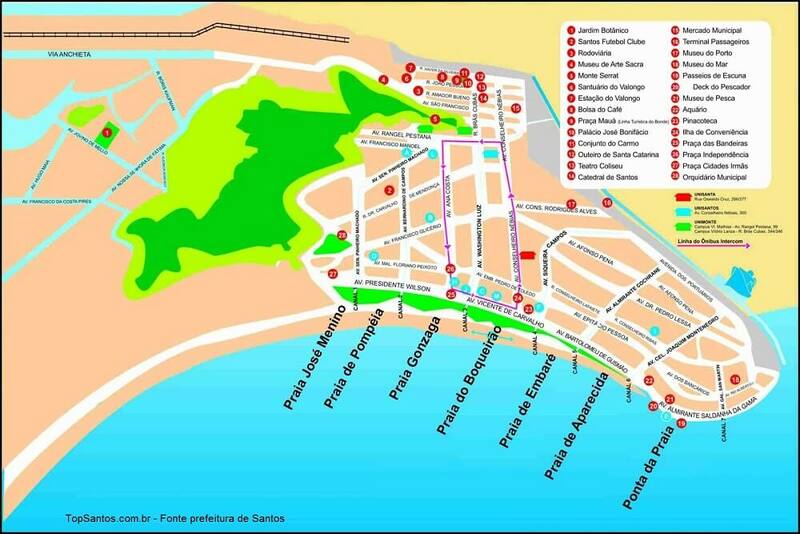 What to do in Santos Beach? In addition to sunbathing, relaxing, bathing in the sea, the Santos Beach is great for those who like sports, soccer, mini-tennis, volleyball, football, basketball, slackline, snooker, coolbol, etc. But what many do not know is that there are some schedules to practice some sports, especially weekend and vacations. The tamboréu and mini-tennis can be practiced until 11h and after 16h. But after 4:00 pm, the fields must be assembled without disturbing the football fields. Volleyball, soccer, basketball and beach tennis not have a specific time. Football from December to February and at weekends and holidays, they must respect the schedules that are until 09:00 and after 18:00 (can start the assembly the fields from 17:30).